Julius Caesar marks several departures for Shakespeare from his previous practice as a playwright. 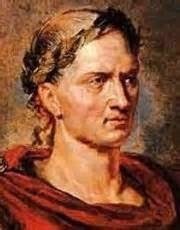 He had tried his hand only once before with classical subject matter, in Titus Andronicus, but he would eventually write three plays based on Plutarch'sLives of the Noble Grecians and Romans, from which he drew for the first time inJulius Caesar. Moreover, in turning to Roman history, he departed from his long interest in English history, about which he had written nine plays. The next play he likely wrote after Julius Caesar was Hamlet, which suggests that tragedy—a genre he had tried twice but not yet perfected—may have been on his mind as he wrote about Caesar's assassination and Brutus's failed attempt at political resistance. These innovations in Julius Caesar call for some sense of what scholars have made of the play's genre and date, the two questions with which the introduction begins. A good deal of critical attention has also been paid to Plutarch's influence, which is evident principally in characterization and plot, the second topic of the introduction. Shakespeare's poetic imagination is the third topic, especially as it manifests itself in the imagery and symbolism of Julius Caesar. Finally, the introduction turns to the implicit sense of Rome that comes through in Shakespeare's Roman plays, includingJulius Caesar. Most historians, both ancient and modern, have viewed the Late Republic of Rome through the eyes of its rich nobility. They regard Roman commoners as a parasitic mob, a rabble interested only in bread and circuses. They cast Caesar, who took up the popular cause, as a despot and demagogue, and treat his murder as the outcome of a personal feud or constitutional struggle, devoid of social content. In The Assassination of Julius Caesar, the distinguished author Michael Parenti subjects these assertions of “gentlemen historians” to a bracing critique, and presents us with a compelling story of popular resistance against entrenched power and wealth. Parenti shows that Caesar was only the last in a line of reformers, dating back across the better part of a century, who were murdered by opulent conservatives. 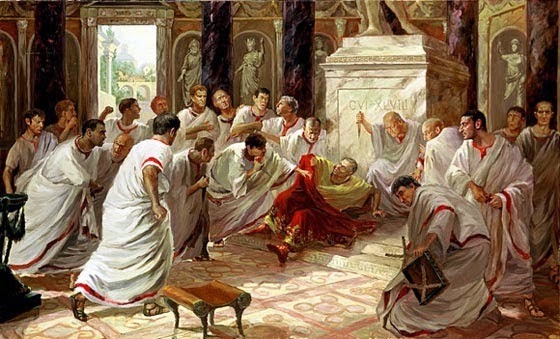 Caesar’s assassination set in motion a protracted civil war, the demise of a five-hundred-year Republic, and the emergence of an absolutist rule that would prevail over Western Europe for centuries to come. Parenti reconstructs the social and political context of Caesar’s murder, offering fascinating details about Roman society. In these pages we encounter money-driven elections, the struggle for economic democracy, the use of religion as an instrument of social control, the sexual abuse of slaves, and the political use of homophobic attacks. Here is a story of empire and corruption, patriarchs and subordinated women, self-enriching capitalists and plundered provinces, slumlords and urban rioters, death squads and political witchhunts. The Assassination of Julius Caesar offers a compelling new perspective on an ancient era, one that contains many intriguing parallels to our own times. From the beginning of its life as a printed play, Julius Caesar has raised questions about its genre. The earliest text was published in the first collected edition of Shakespeare's plays, now called the First Folio, in 1623, seven years after the playwright's death. In this collection the plays are separated into one of three genres—comedy, history, or tragedy—with Julius Caesar printed fifth among the tragedies. Moreover, the title page of the play itself in the First Folio identifies it asThe Tragedy of Julius Caesar (Hinman 717), and the same identification appears in the running title at the top of each page of the play (718-38). Those who organized the First Folio, then, seem to have thought of Julius Caesar as a tragedy. In the First Folio's table of contents, however, the play is identified simply as The Life and Death of Julius Caesar (13). Though the difference may be nothing but an accident of printing, it nonetheless provides a useful basis for asking what kind of play Julius Caesar is. Is it a "history" ("life and death") of powerful men in political contention, or is it a tragedy? 5Platter almost certainly refers to Shakespeare's play as performed in the newly-built Globe Theatre on the south bank of the Thames. Julius Caesar may, in fact, have been the Chamberlain's Men's inaugural play in the new location (Sohmer). Some references in the play itself seem to echo works published in early 1599, suggesting that Shakespeare likely composed it shortly before it was performed (Taylor). 6On first consideration, knowing the probable date of Julius Caesar does not tell us much about the play's genre. In 1599 Shakespeare had just completed Henry V, the last of his Lancastrian history plays, in addition to As You Like It, and he was probably working on Hamlet (Shapiro). Each of those three plays is one of the best examples of its dramatic genre among all of Shakespeare's plays, so 1599 was a year of exceptionally rich creativity for a playwright who is famous for his wide-ranging and diverse imagination. He was just emerging from a period in which he wrote four English history plays that are the best of their genre by any playwright: Richard II, 1and 2 Henry IV, and Henry V. Yet the same period produced some of his best comedies, Much Ado about Nothing and As You Like It among them. Hamlet was the first of four extraordinary tragedies, written between 1600 and 1606, the other three being Othello, Lear, and Macbeth, yet during this "tragic" period Shakespeare also wrote three more comedies, Twelfth Night, All's Well That Ends Well andMeasure for Measure, and the first of his late comedies that recent criticism has identified as "romances": Pericles. 7Amid this unparalleled versatility, one point stands out about Julius Caesar: it was written at the conclusion of a sequence of four history plays and just before the first of four tragedies. While Julius Caesar has much in common with both the histories and tragedies, as the text in the First Folio implicitly suggests, Shakespeare's familiarity and commercial success with history plays suggests that the new play may owe more to what immediately precedes it than to the tragedies that follow. One of the hallmarks of the four great tragedies is that they focus intently on a principal character, for whom they are named. Though Julius Caesar is named for a great Roman hero, he appears in only three scenes (1.2, 2.2, and 3.1), and he dies less than halfway through the action. One of the hallmarks of the English history plays is that they focus consistently and almost exclusively on politics conceived as the effort of strong men to acquire or maintain political power (Cox 97-160). This is certainly true of Julius Caesar. The title character is the most famously ambitious politician of ancient Rome, and he is opposed by another patrician, Brutus, who successfully leads the conspirators against Caesar. Brutus in turn is opposed by Antony, who first appears in Caesar's company (1.2), and who eventually, in alliance with Octavius and Lepidus, triumphs over Brutus. At the end of Julius Caesar, the future appears to belong to these three, but only one of them (Octavius) will eventually go on to vindicate Caesar by defeating the other two and becoming "sole sir o' th' world," in Cleopatra's phrase (Antony and Cleopatra, 5.2.119), and eventually the first Roman emperor. In short, the "undular structure" of Julius Caesar (to borrow John Velz's term) is more akin to the structure of the English history plays Shakespeare had just been writing than to the tragedies he was about to undertake. In effect, Shakespeare seems to have turned directly from English history to Roman history and to have written a play whose characteristics were familiar to him from several years of thinking about how to turn history into drama. For one thing, the wavelike pattern of events that Velz refers to recedes into an unknown past as the action commences, and events similarly open into an unknown future as the play closes, as Shakespeare's history plays invariably do. "The pattern is larger than the play," as Velz puts it (21), as if history is defined by waves of political successes and failures, and Julius Caesarsimply selects a particular sequence of this continuum. The tribunes disperse the plebeians who have gathered for Caesar's triumph in the play's opening scene, because the tribunes favor Pompey, whom Caesar has recently overthrown (TLN 44-62). Yet the play offers no clarification about how the conflict between Pompey and Caesar originated; it is simply presented as a fact of Roman political life. As the play's action develops, Brutus opposes Caesar not because Brutus favors Pompey, as the tribunes do; rather, Brutus thinks Caesar poses a threat to the republic, which is Brutus's chief concern (TLN 626-50). This point helps to make the past even more opaque. What motivated the rivalry between Pompey and Caesar in the first place? Did Pompey also oppose Caesar out of republican sympathies? Was Pompey also a threat to the republic? The ending of the play works similarly to raise questions about the future that are impossible to answer from information given in the play itself. Though Brutus's conflict with Caesar originated in Rome, seat of the Roman republic, the play's concluding battle takes place far from Rome, in what is now Turkey, and no end to conflict is in sight. To be sure, Octavius's last triumphant words seem to vindicate Caesar, because Antony and Octavius have successfully joined forces to defeat Caesar's enemies, and Antony has actually called Octavius "Caesar" shortly before (TLN 2355). But rivalry between Antony and Octavius is palpable from the beginning of their alliance, and Octavius's last line concedes little to Antony: "let's away / To part the glories of this happy day" (TLN 2729-30). While Octavius at least acknowledges that Antony deserves a share of the "glory," he is very far from deferring to Antony, though Antony was the first to take on the conspirators after Caesar's assassination, and Antony is a generation older than Octavius. The tension between two triumphant patricians therefore continues into an unknown future as the play ends, recalling the newly resolved competition between Pompey and Caesar and the budding tension between Brutus and Cassius as the play begins (1.2), which is produced by Cassius's (and eventually Brutus's) competition with Caesar. Where history and tragedy are concerned, it is instructive to compare the ending ofJulius Caesar with the ending of Hamlet, the play that Shakespeare probably wrote after completing Julius Caesar. Far from raising questions about the future, Hamletconcludes by firmly directing attention to the past. Fortinbras has the last word in the later play, having just claimed "some rights of memory" in Denmark (5.2.391), and since he has no rival, the perceivable future is securely his. Yet the play does not make us care or even wonder about Fortinbras's success. His character is undeveloped; he appears briefly just twice (4.4 and 5.2); he is referred to slightingly by both Horatio (1.1) and Hamlet (4.4); and he functions almost entirely as a foil to Hamlet, in that both are bereaved sons determined to avenge their fathers. To be sure, Hamlet involves a struggle for power, as Julius Caesar does, but the possession of power in the end is unimportant, overshadowed by the loss of the play's most intelligent, witty, sensitive, fascinating, and dominant character—Hamlet himself. Hamlet's dying request is for Horatio "To tell my story," and his last words are, "The rest is silence" (5.2.351, 360). Horatio's lament for Hamlet is more memorable and more important than Fortinbras's claim of right in Denmark, and Horatio's lines after Hamlet's death all direct attention to Hamlet's story, just as Hamlet had requested. 11The open-endedness of Julius Caesar is not only a quality that the play shares with Shakespeare's history plays but also one that David Kastan identifies with Shakespeare's sense of secular history itself (41). The only dramatizations of history that Shakespeare knew were regional productions of biblical history—Coventry's most important among them because of its relative longevity and its proximity to Stratford, Shakespeare's home town: the Coventry plays were performed until 1580, the year Shakespeare turned sixteen. Kastan points out that in these ambitious, sometimes days-long productions, history is interpreted as a discrete sequence of events in which God interacts providentially with humankind: the creation, the fall, Noah's flood, and similar events from the Hebrew Bible, culminating in the ministry, trial, crucifixion, resurrection, and ascension of Jesus, and the last judgment (Kastan 4-5). These plays' definitive revelation of divine action in history determines their episodic, non-linear quality and also their absolute beginning (creation) and ending (doomsday). Shakespeare's plays about secular history are, by contrast, open-ended, because their action is insistently continuous with events that precede and follow them in the endless continuum of secular time. What Shakespeare's history plays therefore reveal is not the hand of God but the shaping influence of human action in the perpetual contest for power. Only one anachronistic allusion to the last judgment is made in Julius Caesar, when Trebonius exclaims, after Caesar's murder, that onlookers panicked, "as it were doomsday" (TLN 1312). The simile explains the startled reaction to Caesar's assassination without defining the event's meaning, in contrast to the biblical doomsday, which reveals the meaning of human history as described in the book called Apocalypse or Revelation; only the ongoing succession of Roman events can provisionally reveal the meaning of Julius Caesar, and the play's open-ended structure insists that revealing events will continue after the play ends, making the significance of the piece of history we have just witnessed impossible to determine in itself. Despite Cassius's success in soliciting Brutus's support for the conspiracy against Caesar, and despite their mutual success in the assassination, Cassius's death on his birthday seems to suggest that he has accomplished nothing. He is afloat on a full sea, in Brutus's image, and they have lost their venture (TLN 2221-23). But in this respect they are like all the other competitors in Julius Caesar, in that all are part of time's undular action, rising and falling with the endless tide of political history.